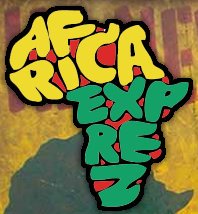 Home » Events » The Africa Express hits KX – and we’ve got tickets to give away!!! Comments Off on The Africa Express hits KX – and we’ve got tickets to give away!!! It all began in 2006 with a trip to Mali, when co-founder Damon Albarn took the likes of Fatboy Slim, Martha Wainwright and Jamie T to work with African legends such as Toumani Diabate, Salif Keita, Amadou & Mariam and Bassekou Kouyate. This was followed by a trial London event, then the now-legendary Glastonbury 2007 show, followed by trips to Nigeria, the Congo, Ethiopia and shows at the BBC Electric Proms, for 25,000 people in Paris town centre and with 50,000 people on a Spanish beach show. 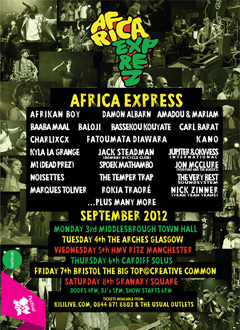 Tickets cost £20 each from http://www.kililive.com/artists/africa-express. But you could be there for free!!! Which African duo first met at Mali’s Institute for the Young Blind? What does the Baloji song title Nakuenda, a Swahili word, translate to in English? Which King’s Cross African restaurant is closest to the station as the crow flies? King’s Cross Community Projects, 32 Battlebridge Court, Wharfdale Road, London N1 9UA. Entrants must be aged 18 or over. All entries must be received by 7pm 1st September 2012. Correct entries will be placed in a hat and the two winners drawn at random. Trustees and contractors to KCCP may not participate. The draw will take place on Sunday 2nd September. Winners’ names will be listed on organisers’ websites.